Sunday’s (9 December) white truffle auction in Hong Kong netted HK$204 million (£16.4 million) for a local charity. Hong Kong’s three-Michelin star Chef Umberto Bombana, known as the “King of White Truffles” once again lived up to his moniker and provided a sumptuous white truffle feast for an elite audience, whose largesse provided a healthy HK$204 million for local charity Mother’s Choice. Bombana, who recently celebrated the retention of his three Michelin stars for his Hong Kong restaurant, 8 ½ Otto e Mezzo BOMBANA, in the 2013 Michelin Guide for Hong Kong & Macau, hosted the auction on Sunday. He served a unique seven-course menu designed to celebrate that rare and exquisite delicacy, white truffles. 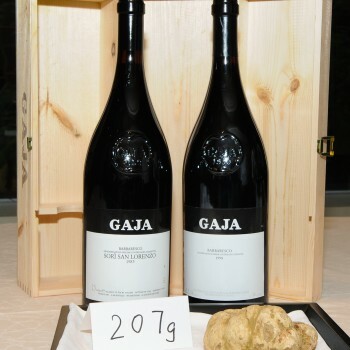 A special selection of rare vintage Gaja wines in Italy provided the perfect pairing with the truffle-themed dinner. Guests bid on the legendary Alba truffles, which were paired with packages including wines, holidays and set dinners. The five lots were sponsored by Gaja Winery, Edrington HK, Banyan Tree Ungasan-Bali, Baita 1697, and 8 ½ Otto e Mezzo BOMBANA. The auction saw six valuable pieces of white truffles, weighing 1596g in total, auctioned off for a total of HK$1.18 million (£95,000), adding to the total raised. Eighty guests were in attendance and the bulk of the fundraising was achieved by bidding on tables for the event. The highest bid of the evening’s white truffle auction reached a staggering HK$320,000 (£25,700). The successful bidder was Mona Hsu, who successfully bid for a 358g white truffle, along with a week-long luxury ski package. A two-piece truffle set weighing 575g in total (402g and 173g, respectively) along with a 12 person, five-course menu and wine pairing was successfully bid for HK$280,000 (£22,500) by an anonymous guest. All profits went to the Mother’s Choice charity, a local initiative which provides young mothers in Hong Kong with support and care throughout – and beyond – their pregnancies.